Following yesterday’s announcement of a new iPad Air and a new iPad mini, Apple has released some updated iMacs. Apple has three different iMacs in their line of All-in-one desktops and all of them got updated, or some new configuration options. Following yesterday’s announcement of a new iPad Air and a new iPad mini, Apple has released some updated iMacs. Apple has three different iMacs in their line of All-in-one desktops and all of them got updated, or some new configuration options. Let us start with the 21.5-inch iMac. The 21.5-inch iMac has received some new 8th generation Intel processors. The iMac 4K, has a quad-core 3.6GHz Core i3 or a 3.0GHz 6-core Intel Core i5. Either model is configurable to a 3.2GHz 6-core Intel Core i7. This is the first time that a 6-core processors have been available on the 21.5-inch iMac. The 4K iMac still comes with 8GB of memory, but this is a bit faster at 2666MHz. There is one additional change to the memory. It can still be configured with 16GB, but now you can also continue it with 32GB of memory. The graphics have been slightly improved form the Radeon Pro 555 to the Radeon Pro 555X. The higher end 4K model comes with a Radeon Pro 560X with 4GB of VRAM, but can be configured with a Radeon Pro Vega 20, if you choose. The storage options for the 21.5-inch iMac remains the same, with the lower-end model coming with a 1TB 5400RPM hard drive. The higher-end model comes with a 1TB Fusion drive. You can configure either model with a 256GB, 512GB, or 1TB SSD. This is a slight change to the previous models were not able to get anything more than a 512GB SSD. The prices for the 21.5-inch iMac have not changed, so it still starts at $1299, and the higher end-model starts $1499. Let us look at the 27-inch iMac. The 27-inch iMac also got some nice upgrades as well. There are three different base configurations for the 27-inch iMac. The 27-inch iMac has received 9th generation Intel Processors for the iMac. All three models have 6-core Intel Core i5. processors. The speeds start are 3.0GHz, 3.1GHz, and 3.7GHz, respectively. The two higher-end models can be configured for a 3.6GHz 8-Core i9 processor, if desired. All three 27-inch iMac Models come with 8GB of 2666MHz of RAM. The configuration options remain the same, at 16GB or 32GB for all models, and the two higher-end models can be configured with 64GB of memory. The 27-inch iMacs still come with the same storage options, meaning they come with 1TB or 2TB fusion drives. All of them can be configured with a 2TB Fusion drive, 256GB, 512GB, or 1TB SSD. The two higher-end models can also be configured with a 3TB Fusion drive, and the highest model can be configured with a 2TB SSD. The graphics on the models have been improved to the Radeon Pro 579X, 575X, and 580X respectively. The highest-end model can be configured with a Radeon Pro Vega 48, which includes 8GB of Video Memory. Just as with the 21.5-inch iMac, the base price of the 27-inch iMac models have not changed. They still start at $1799, $1999, and $2299 respectively. There have been some last configuration options, and those are with the iMac Pro. The iMac Pro is the best all-in-one desktop Mac that you can buy. It is designed for users who know that they need the amount of power is provided by the iMac Pro. There have been a couple of additional configuration options made available for the iMac Pro. The iMac Pro can now come configured with a Radeon Pro Vega 64X. The 64X comes with 16GB OF HBM2 memory. The 64X can handle 12 teraflops of single precision and 24 teraflops of half-precision. This is a slight improvement over the Radeon Pro 64. There is one last configuration option available for the iMac Pro. You can now configure an iMac Pro with 256GB of memory. Doing so will cost you $5200, which is more than the base price of the iMac Pro. If you know that you need 256GB of memory, it is now an option available for you. I normally do not have many thoughts regarding a spec bump on a product. However, I do have some thoughts regarding the 21.5-inch iMac. My thoughts are specifically about the storage options. The base model of 21.5-inch 4K iMac comes with a 1TB spinning hard drive. To me, this is no longer acceptable as an option. I get that there needs to be some differentiation for pricing, and there is some with the quad-core Core i3, and the 3.0GHz 6-core Core i5, which is between the two models. The biggest problem with this 1TB hard drive is that it is 5400 RPM. Apple charges $100 for a 1TB fusion drive upgrade. To me, the 21.5-inch 4K iMac should come with 1TB Fusion drive. I completely understand not having 2TB be the base, but the 5400RPM hard drive is really slow, particularly if you need to do anything that is disk intensive, like running a virtual machine, or transferring a number of files all at once. I get that having an all SSD model is not feasible, with the current design, but there is no reason that a Fusion drive could not be used. Having a Fusion drive would got a long way to providing the best experience possible. The specification bumps to the iMac line are solid upgrades. 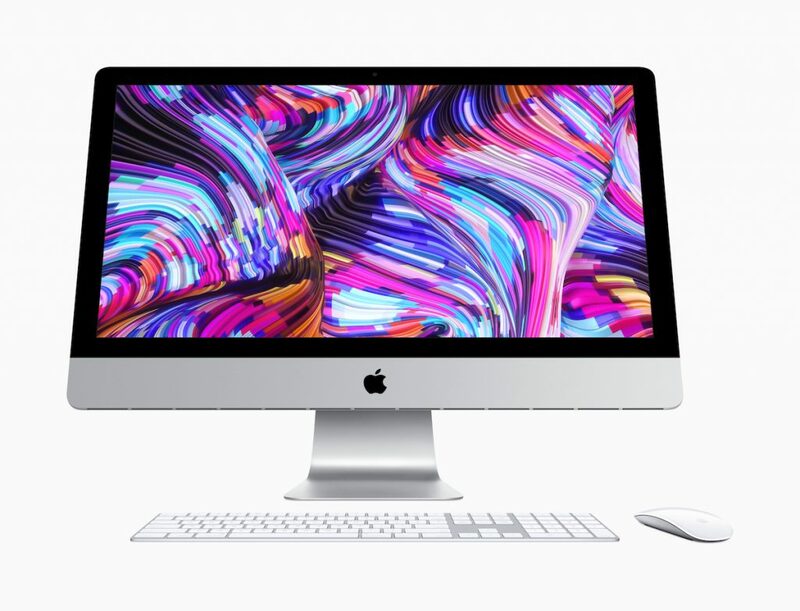 The inclusion of the 8th Generation Intel Processors in the 21.5-inch 4K iMac, and the 9th Generation Intel Processors in the 27-inch iMac will result in even better performance. If you are in the market of an iMac, now is a great time to buy that new iMac. IF you are in the market for an iMac Pro and can use either the Radeon Pro Vega 64X, or 256GB of memory, you can now configure a model with even more options. All of the iMac models, and iMac Pro configuration options, are available now.